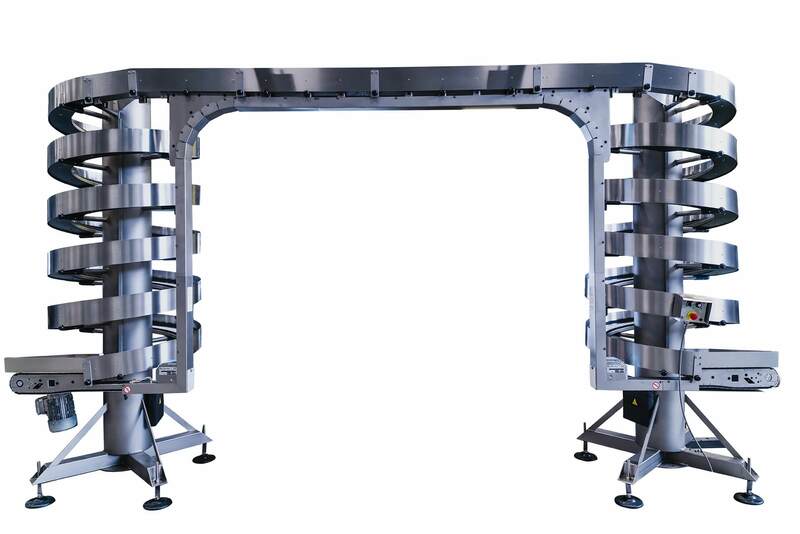 The AmbaFlex Portal is a high level bridging solution using two AmbaFlex spirals. In many warehouses and factories space is valuable and access can easily be blocked for both pedestrians and forklift trucks by conveyors. The Portal solution elevates the products up using a spiral, over a bridge and down another spiral. This solution removes the need for lift up dates and step overs and takes up less room than incline and decline belts. There are 2 versions available, the standard Portal which has a merge point between the spirals and the bridge and the Portal One, this has a single belt running through all 3 parts. There are many configurations available utilising different spiral types and various bridge lenghs and shapes.